On Wednesday, May 14, leaders in medicine, science, IT and librarianship convened at the Natcher Center on the NIH campus to reflect on the contributions the National Library of Medicine has made over the last 30 years, and help chart its course for the future. They were drawn to “The National Library of Medicine, 1984 -2014: Voyaging to the Future,” a symposium co-sponsored by the NLM Board of Regents, the Friends of the NLM and the Medical Library Association. The event was the Library’s first step in developing its next long range plan. Attendees discussed NLM’s past role and future opportunities in key areas: access to information and data; conducting and funding informatics research; and training future generations of librarians and informatics researchers. You are invited to add your comments on NLM’s past and its future by visiting the Voyaging to the Future symposium blog http://voyagingtothefuture.nlm.nih.gov. There, you also will find the agenda for the event, which was recorded and can be viewed on the NIH videocast site. Whether clinician, medical librarian, NLM grantee, computer or bioinformatics expert, NIH staffer, distinguished scientist, government official, or corporate executive, they voiced overwhelming support of the NLM’s record of the last three decades under the leadership of NLM Director Donald A.B. Lindberg, MD. The following comments provide a sense of the depth and breadth of the symposium. 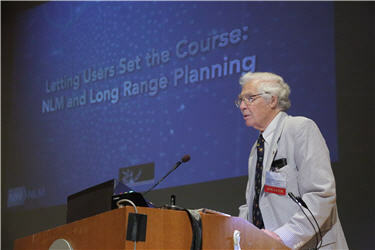 Dr. Lindberg reflected on major achievements he said stemmed from the ideas of the people who served on NLM’s long range planning groups and advisory committees, many of whom were in the audience. “If you hear something you like, take credit for it,” he said as he described the genesis of the National Center for Biotechnology Information (NCBI), the Visible Human Project (a digital library of the human anatomy); the Unified Medical Language System (UMLS) which helps computer systems work together; outreach to the underserved; and 24/7 access to information. Technology and “luck” helped too. “We floated ahead on waves of progress by other people, even other organizations,” he said, noting advances in computing machines, telephone networks and Internet access. “The last 30 years have been absolutely wonderful fun,” observed the NLM Director. Former NIH Director and current National Cancer Institute Director, Harold Varmus, MD, recalled the creation of PubMed Central, the free, full-text archive of biomedical literature. James Cimino, MD, pointed out the singular position NLM takes within NIH when it comes to informatics. Dr. Cimino is Chief of the Laboratory for Informatics Development in the NIH Clinical Center, and an NLM investigator who has directed NLM-sponsored courses in biomedical informatics. Alexa McCray, PhD, recalled the development of ClinicalTrials.gov. McCray, who directs the Harvard Medical School Center for Biomedical Informatics, led ClinicalTrials.gov during her years at NLM. Elaine Martin, MSLA, DA, director of Library Services at the University of Massachusetts Medical School described how NLM has helped change the professional identity of librarians and librarianship through its development of new products and services and its support for training. Perhaps among symposium participants, Katherine Gottlieb, MBA, DPS, CEO of the Southcentral Foundation, a health care organization in Alaska, and an NLM Board Member was uniquely qualified to make the case for NLM’s once and future role. 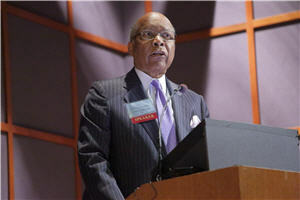 Top Photo, NLM Director Donald A.B. Lindberg, MD. Bottom Photo, the Honorable Louis Sullivan, MD.